United Wagon Company has the capability and experience of conducting the full cycle of work with railway freight wagons: from design and production to operation, maintenance and repair. As we look to develop the next generation of freight rolling stock, we are closely examining growing international experience with the application of various digital technologies in wagon manufacturing – technologies which we believe can minimise or entirely eliminate the human factor in decision-making which can improve the openness of infor­mation available on asset condition and ulti­mately traffic safety. Russian rolling stock manufacturing has made significant progress in entering off-shore markets in recent years. The potential for the export of rolling stock export is reliant on four major factors: the availability of a competitive product, cheap money, well-organized maintenance and a successful track record of delivering projects. In 2010, Russia was awarded the rights to stage the 2018 FIFA World Cup. Preparations started immediately. Eleven cities – Moscow, Kaliningrad, St Petersburg, Nizhny Novgorod, Volgograd, Kazan, Samara, Saransk, Rostov-on-Don, Sochi, and Yekaterinburg (see pic. 1 and Table 1) – hosted fans and guests from around the world during the 21st World Cup, which ran from June 14 to July 15. Providing comfortable and convenient travel between the host cities was one of the most challenging and ambitious objectives for the tournament’s organisation team. Railway transport played a significant role in achieving this and successfully transported more than 5 million football fans and visitors between host cities during the tournament. In the coming decades, the mass deployment of digital technologies will accelerate the development of Russia’s industry and economy. Russia’s national development guidelines identify Russian Railways (RZD) as a crucial actor in the process to overcome the complex social and economic challenges which could significantly impact opportunities for industrial growth. By establishing new transport and logistics routes, RZD will help to serve the needs of both the Russian and global economies as well as provide quality services to the general public. Russia’s passenger rail sector is experiencing dramatic changes in its regulatory environment. By softening entry barriers and making the segment more transparent and reliable by providing guarantees over long-term subsidies, the Russian government is looking to spur market competition, which it hopes will result in improved service quality and make the sector more attractive to third-party financial investment. What role can CNG and LNG play in railway transport? This article discusses the use of LNG and CNG-based fuels for rail operations, considering the advantages and disadvantages and the vision for their future use. Russia’s rolling stock manufacturing sector recorded significant growth in the production of primary railway industry products between 2015 and 2017, which translated into improved revenues for the leading companies. Developments in domestic mainline and urban rail markets encouraged local manufacturers to further update and modernise their offers. These improvements have relied on both in-house and imported technical solutions. In 2013, Moscow Metro issued a request tender for the supply of new metro cars and their subsequent maintenance for 30 years. Bidding followed in 2014 with seven manufacturers taking part: Alstom; Hyundai; Škoda; Siemens in partnership with Russian Machines; Uralvagonzavod in consortium with Bombardier; Sinara in consortium with CAF; and Metrovagonmash. Despite Siemens (2013) and the CAF-Sinara consortium (2014) preparing and submitting full-scale mockups of the cars they were offering, Metrovagonmash secured the 1.7bn EUR contract to supply 96 eight-car trains (768 cars in total) in December 2014, with the manufacturer set to supply the trains between 2017 and 2020. Train design was performed by Metrovagonmash’s design-engineering office, which has been a separate business unit within TMH Engineering since 2017. Overhead catenary systems installed on high-speed lines possess a number of unique characteristics that ensure safe and smooth train operation. This includes the increased tension of a contact wire, messenger cables and connecting wires; thermal endurance and wear resistance; increased mechanical strength of contact wires and cables; minimal mass of all structural elements but not at the expense of strength and durability; and reliable rust protection. To satisfy these stringent requirements, Ø 120- 150mm2 low alloy copper or bronze contact wires are traditionally used. The contact wire shall have minimum sag, which is ensured by an overhead catenary system that uses closely spaced droppers to attach the messenger wire or catenary to the contact wire. How can machine learning and BigData benefit locomotive transmission diagnostics? The opportunity to use data from a locomotive’s onboard microprocessor control system (MCU) to perform diagnostic tasks has been discussed ever since the first MCU-equipped locomotives became available. TMH-Service’s Maksim Gorky division initiated MCU data reading and manual transcription in the autumn of 2012, and in the summer of 2013 presented its first automatic workplace applications (AWA), which are offering semi-automatic diagnostic tasks using previously-developed diagnostic algorithms. On the back of this initial success, LocoTech’s Smart Locomotive project has set an ambitious task to automate not only MCU data development, but the whole diagnostic algorithm development process. By applying BigData and Machine Learning methods, the team working on the project is aiming to improve diagnostics objectivity by replacing the judgement of human engineers with statistically-proven patterns, which are normally invisible to the human eye. A variety of Lithium-ion batteries are now available for a wide-range of uses in different systems and applications. With significant cost-saving benefits on offer compared with traditional lead-acid batteries, use of these batteries is becoming increasingly widespread. 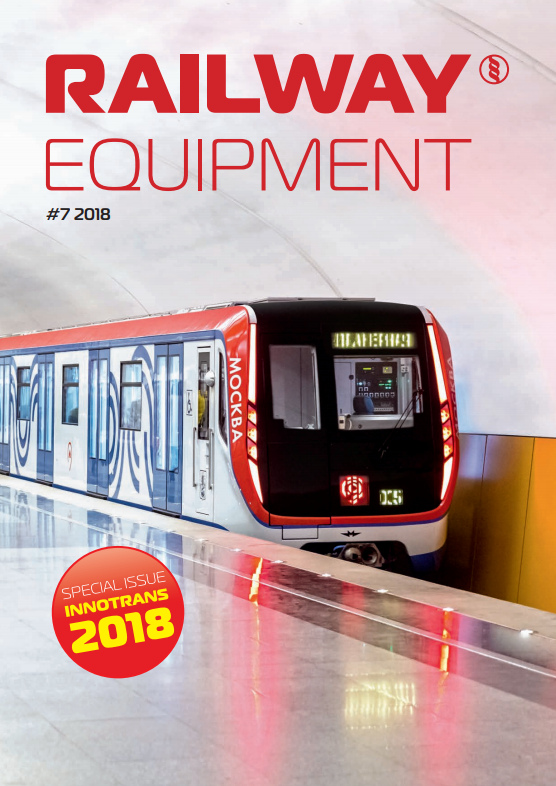 The introduction of International Railway Industry Standards (IRIS) (ISO/TS 22163) at Russian railway industry suppliers has sparked enhanced studies into areas such as product reliability, availability, maintainability and safety management, including products’ lifecycle cost management (RAMS/LCC), project management, and configuration management. In particular, significant work has been carried out regarding the implementation of RAMS/LCC. This includes the development of the regulatory base, reorganisation of activities, and employee development, including through participation in foreign workshops and greater willingness to share experience. Russian Railways’ (RZD) performance since it was established 15 years ago has shown that the decision to create a single company to act as the customer for both locomotive and passenger rolling stock, and thereby support Russia’s leading rolling stock manufacturers, was warranted. A number of key objectives have been successfully achieved, including the introduction of innovative technologies and large-scale upgrades to production capacity. In the entire course of history, 11 years is a very short space of time. However, at an institution where all industrial representatives are working together toward specific and shared objectives, a great deal can and has been accomplished in this period. The non-profit Partnership Union of Railway Equipment Industries (UIRE) was established on June 14th 2007 by Russian Railways (RZD), Transmashholding, Concern Tractor Plants and Russian Corporation of Transport Machine Building. The founder and president of the organisation is Valentin Gapanovich. The partnership now consists of 156 member companies from the 34 federal states of the Russian Federation. Together the member companies are responsible for almost 90% of Russia’s total railway industrial output.